As residents of the Northwest, we can’t help but notice that August has become Smoke Season. Smoke and haze come to our area from fires both local and far away. Depending on the jet stream, we may get smoke from as far away as California, Alaska and British Columbia! When there are air alerts and you are advised to stay indoors, is there anything else you can do to breathe easier? If there is a smoke-free day, open your windows and flush your home of stale air and bring in the fresh air. This is especially important the longer your home has been closed up. Use your furnace fan to circulate your indoor air and run it through your air filters. Replace air filters before and after fire season with a high-quality allergen rated filter. HEPA filters will help with allergens and most particulates, however, smoke also contains gaseous pollutants that are more difficult to remove. Use an additional air cleaner, position it in a central location near your largest return air duct that contains a carbon filter for additional air cleaning. Don’t add to the problem with candles, incense, vacuuming or cigarettes! In your car keep the windows closed and use your air conditioning in the “Recirculate Mode”. If you need to use a mask, don’t use a dust mask, use a N-95 or P-100 designated mask as they are designed for smoke particulates. They are available at most hardware stores. If you have breathing and/or allergy issues be sure stay indoors and to use your medications as prescribed. Don’t hesitate to see your doctor if you find yourself coughing or losing your voice or feeling ‘foggy’. These are all symptoms of breathing issues. 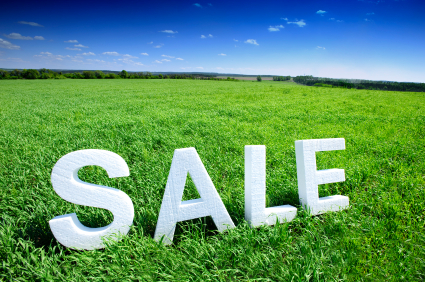 During the boom of the early 2000s, everything in real estate was about resale. Every decision that homeowners and builders were making was about mainstream tastes, neutral colors and what the ‘market’ wanted to buy. And that is how we ended up with acres and acres of beige homes with almond windows and almond trim. It’s no wonder we are seeing a resurgence in color and unique features and finishes, we’ve been ‘beige-ed out’. Color and finish are great ways to show your personality, frame your furnishings and possessions and bring joy into your daily life. For me a beautiful color in my bedroom helps me wake up with a smile! While I don’t recommend intense color all over the place, there are spaces that can take more color. Bathrooms, entryways, and dining rooms are great places to go deeper with color or bring in an unusual material. Walls that have big windows or lots of shelving are also good candidates for a bold color choice. Keep in mind that white trim will really make colors pop! 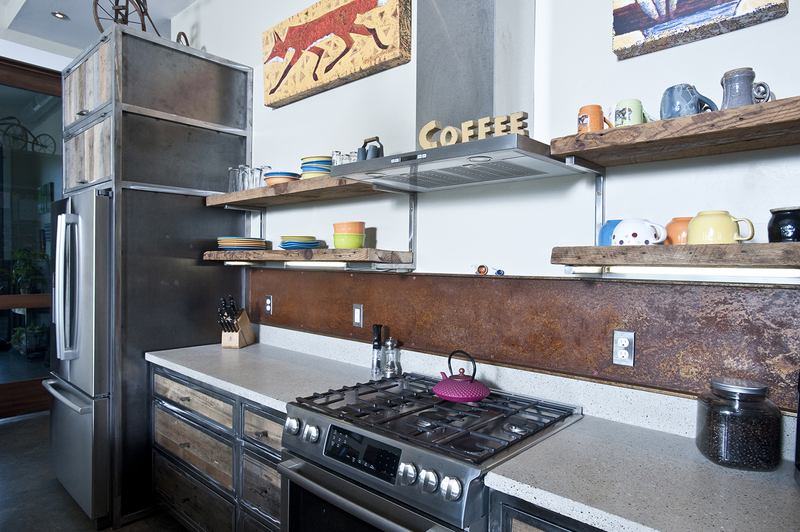 Accent walls can be done out of almost anything: wood, steel, wallpaper, flooring and cork. Lots of materials can be applied to a wall – I’ve seen sheet music used as wall paper! Wainscot paneling will tend to cut a room in half, using a whole wall is a more modern approach that will make the room seem taller. Finish materials can add color and texture and even bounce light – so get creative! 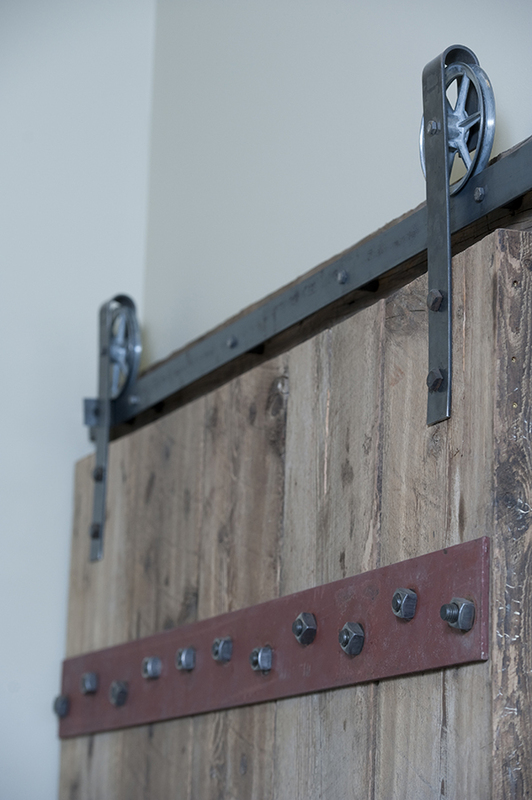 Barn doors are a great place to add color and texture to a wall since they are out in the open and take up a lot of wall space – why not make it unique and colorful? 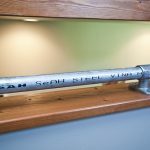 As we get into the finish stages of a project, I have a list of ‘art projects’ that have popped up over the course of the design and building process. Often, it’s a built-in or a door or a trim detail that came out of a serendipitous remnant, craigslist find or brainstorm. Metal roofing can become a backsplash. 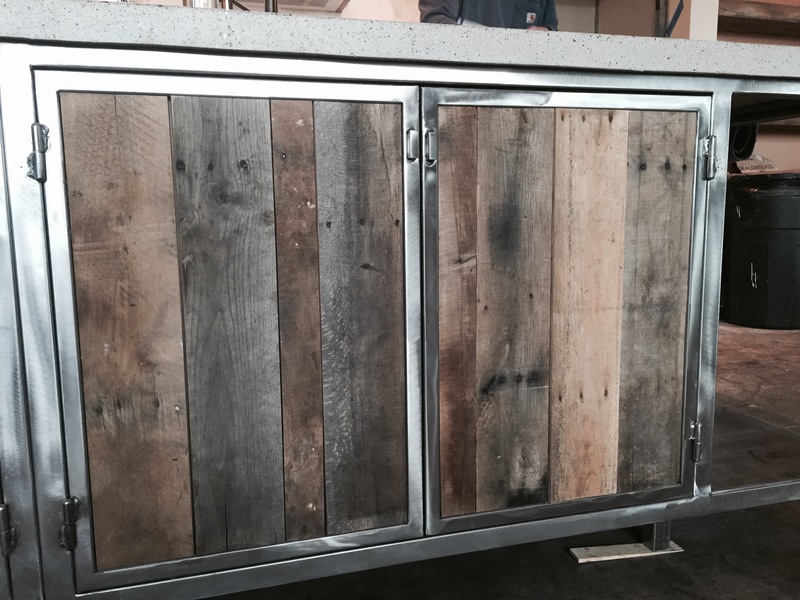 We’ve built doors and shelving out of leftover flooring, metal strapping, reclaimed lumber and ceiling material. Reclaimed trusses can be the inspiration for a whole house build! 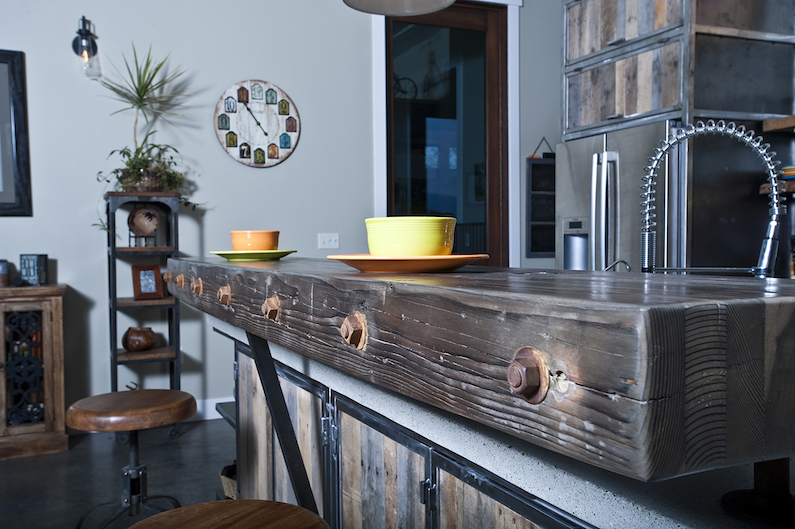 Salvaged bowling alley can make beautiful (heavy – it’s more than 2” thick) countertops, benches and shelving. 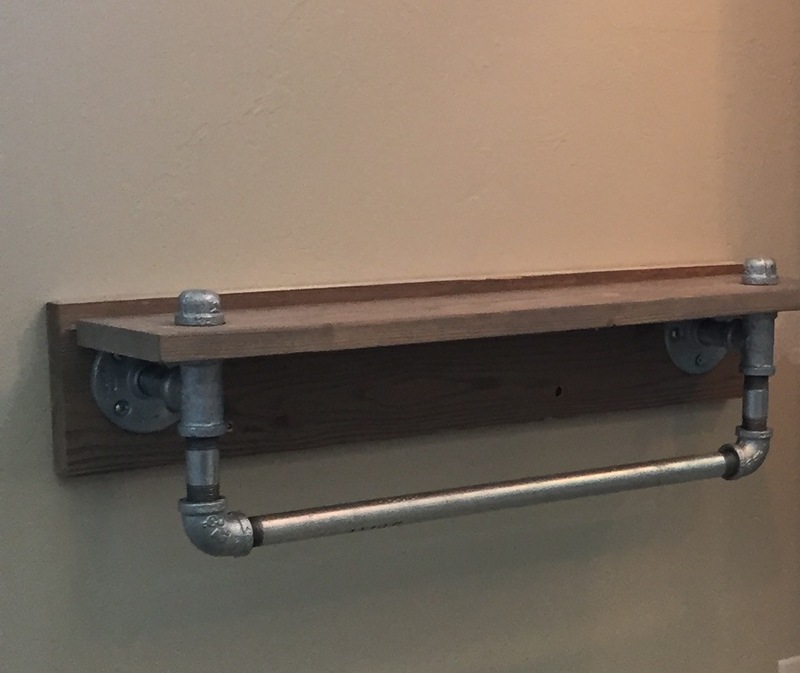 Metal pipes can become a handrail or towel rack. Penny Lane Home Builders will create a unique home for you! Rememb er the days of the washer and dryer located down in some dark, dank corner of the basement? Well those days are over – laundry rooms are growing in size, prominence, furnishings and functions. 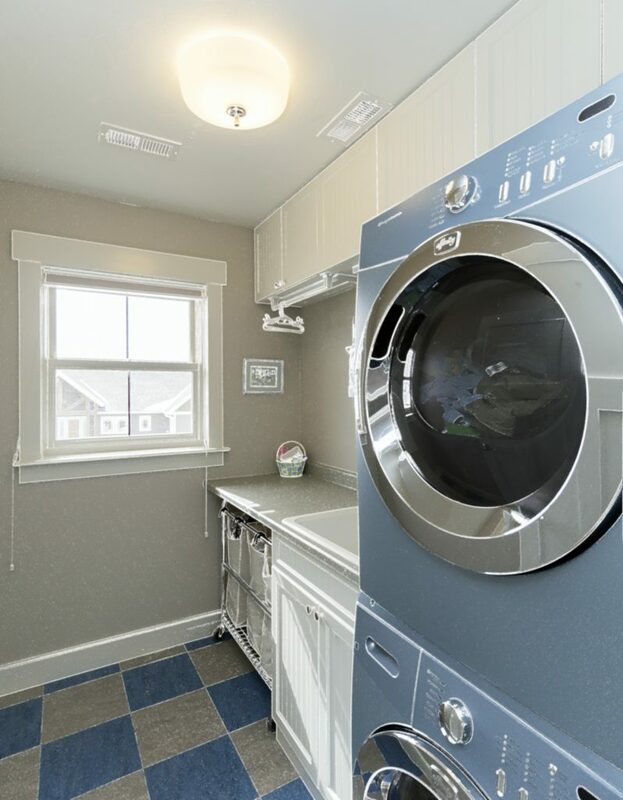 No longer relegated to basements and back rooms, laundry rooms are going where the laundry is – next to the bedrooms, even when they are upstairs, like this one in our model home complete with a stacked washer/dryer, sink, rolling laundry baskets and plenty of storage. 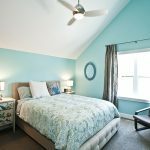 Just imagine all the activities that can happen in a room with the washer and dryer and some counter space: crafts, wrapping and shipping, sewing, hobbies, projects, homework, pet supplies and grooming. 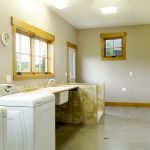 In our dog-loving community, if you have the space, adding a pet washing station in your laundry or mudroom, can be one of the best design decisions ever made! Our home owners in this picture are daily grateful for the dog washing and grooming station they added to their laundry room! With thoughtful furnishings, good light and a sink – the sky’s the limit. 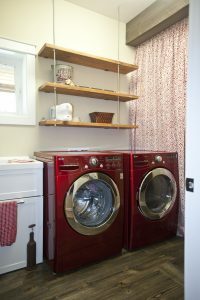 Be creative in how you can ‘hide’ the less glamorous elements of a utilitarian space like a laundry room. In this picture, one of our homeowners had a fake beam installed and hung a curtain to hide the water heater. Some stylish but functional suspended shelves, make for an inspirational space! If you are looking for more ideas or inspiration, there are some great articles on laundry rooms on Houzz as well! For complete portfolios of a number of our projects, check out our gallery or follow us on our Facebook page! As we burrow in for the long winter here in Montana, it is a good time to consider the condition of our indoor air. Get your furnace checked and filters cleaned. Make sure that ventilation fans in the baths and kitchens are working – and use them to vent indoor pollutants all year round. On our coldest and driest days a little humidity can be helpful, but don’t overdo the moisture. Keeping humidity levels below 40% keeps dust mites at bay. Too much moisture leads to mold and mildew as well. We are fortunate to have the occasional warm day which is the perfect time for a House Flush: turn off your furnace and open several windows for a half- hour or so to flush out the stale air. Close the house back up and turn your heat back on. Have a warm and healthy winter season! 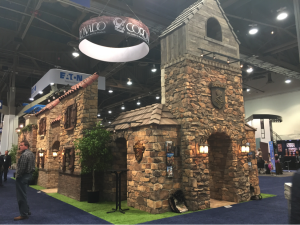 I spent a few days in January at the International Builders Show attending seminars and checking out new product and trends in the building industry. This show is one of the biggest trade shows in the world, taking over the entire Las Vegas Convention Center! They built whole houses in the parking lot, full operating kitchens and baths on the exhibit hall floor and some over the top booths. ar plywood sheathing, adding a step to the sheathing process. Many have a rain screen or vapor barrier laminated to the outer surface, which is a huge advantage over a building wrap applied on site. For those of you looking for the next trend in appliances, GE makes a slate finish, which is warm and metallic with a completely different look than the ubiquitous stainless. Color palettes tended toward neutral with bright pops of color or texture. Thermador is celebrating their 100th anniversary with a line of graphic refrigerators that bring art into the kitchen. Induction cooktops were everywhere along with convection wall ovens paired with built-in wall microwaves. I visited with the makers of a product called Infinite-R. This product is a Phase Change Material, which purports to add R-value to your building. The material absorbs heat during warm periods becoming more plastic and then releases the heat energy during cooler periods to return to its rigid state. My friend Randy Hafer with High Plains Architects in Billings has added this material to his New Frontier House. Everywhere I looked there were options in doors: barn doors, giant doors, super modern doors in every color and finish imaginable. 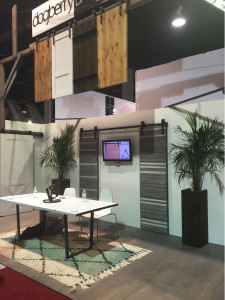 Modern, Rustic and Modern Rustic styles were everywhere and barn doors are a great look for any of these styles! There is so much to see and learn at the Builder’s Show that I was happy to have my husband Dan along with Al and Gina Stream to walk the exhibit halls while I was in seminars and find the really interesting exhibits. Structural Insulated Panels are typically composed of rigid foam insulation sandwiched between two strand boards — kind of like a s’more. The exterior skins are attached to the foam core with a high-strength adhesive. The foam core material is high-density expanded polystyrene. The foam core serves as a spacer and insulator between the exterior skins. Altogether, the structure acts as a monolithic whole — as opposed to stick-frame construction using 2-by-4s, where hundreds of individual nailed connectio ns hold the studs and skins together. As a result, SIPs are twice as strong as a wood-framed house and extremely energy efficient. 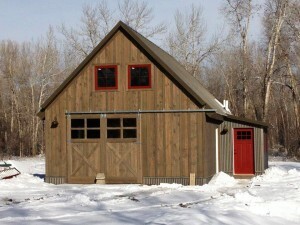 Compared to a typical stick-frame house, a house built of SIPs will require about half the energy to heat and cool throughout the year in most climates. It’s not just the thickness of the polystyrene inside that makes SIPs more energy efficient — it’s that the whole panel is designed to function as one structural unit. The thermal “tightness” and resistance to heat flow work with the insulation value to achieve exceptional comfort and energy efficiency. SIPs also help conserve forest resources, because they produce almost no waste. 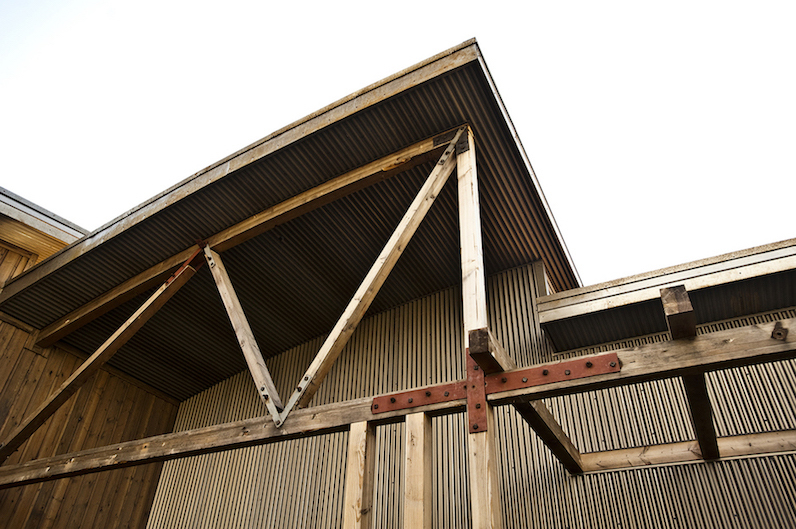 As worldwide timber quality and availability continue to decline and the costs of labor and energy increase, SIP construction should become more popular and cost-effective. 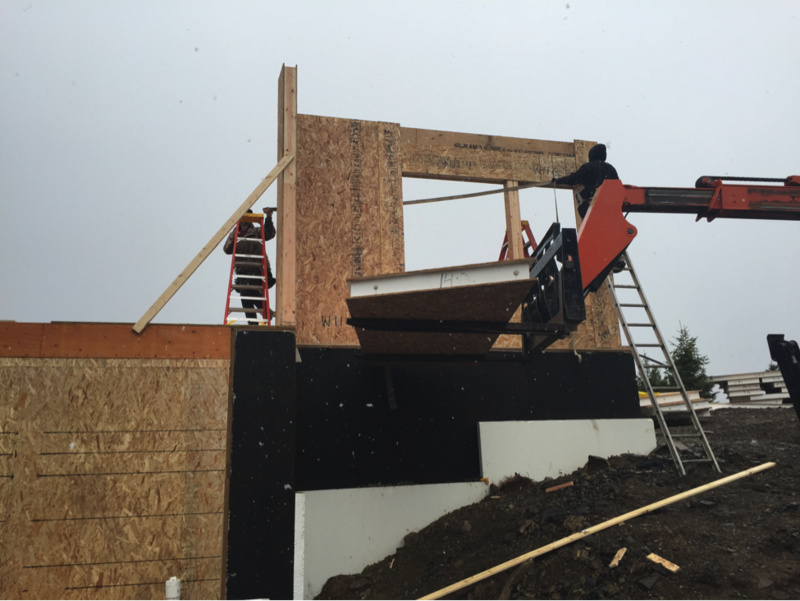 We get asked the question about whether building with SIPs is cost-effective vs. framing. We have run numbers on this several ways. The key is to compare ‘apples to apples’. You cannot compare SIPs to cellulose or batt insulation, or to 2×4 construction. I have priced out two homes both ways. 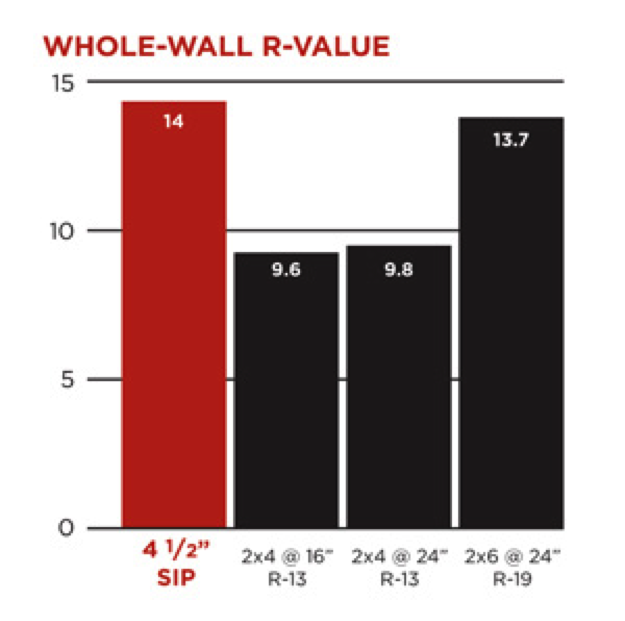 Comparing the cost of SIPs walls to 2×6 framed walls with 3.5″ Corbond insulation — there was a difference of about $1000 more for the SIPs on a 3500 sf home. Keep in mind that the SIPs panels have about 40% more insulation due to fewer thermal breaks (fewer studs, less lumber equals more insulation). It really depends on the design and if you want to use SIPs, design with them in mind from the beginning. We have not found SIPs to be profoundly faster (or cheaper) for custom homes due to complicated framing/structural issues, but you do reduce the amount of time needed for the insulation subcontractor (1 day vs 1 week)as he usually just has to insulate windows/doors, garage wall, and the odd framed area. 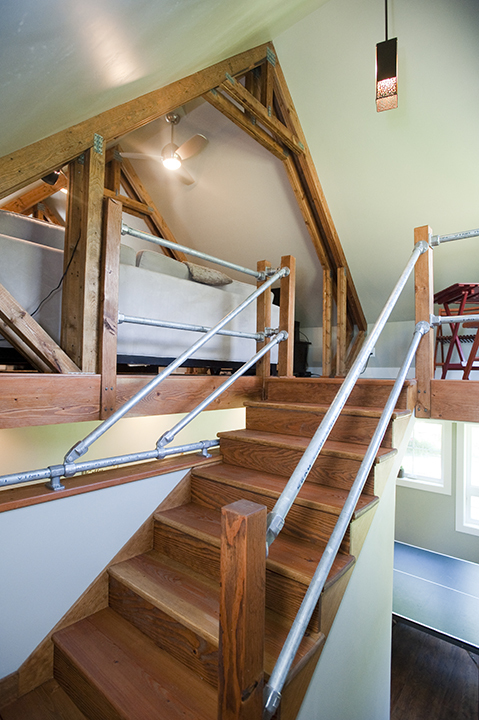 A very simple design does speed things up and could save framing labor if your framer is experienced in SIPs. We try to design for SIPs from the outset and work with local contractor Big Sky Insulation in Belgrade. Online Plans – to Buy or not to Buy? Looking at house plans online or in catalogs is a lot of fun and if you find a plan or two that you really like they can seem like a great way to save some money in your building budget. While I encourage you to look at plans and learn about your likes and dislikes, I generally discourage the purchase of plans from these resources for several reasons. While the plans sold through plan companies are drawn to meet nationally recognized building codes, they may or may not apply to your local jurisdiction. Every region has local variables and issues that the local codes address. In our area of Montana we have seismic, snow, insulation, infiltration and radon considerations. In the mountains we also have steep slopes, rocky soils and enormous snow loads. Some regions have expansive soils or high water and hurricanes. So while your purchased plans may look nice, chances are they will have to be re-drawn to meet local permit requirements after consultation with a local engineer. Chances are that even if you love a certain plan, there will be something that you want to adjust or tweak. There may be changes that have to be made to accommodate your neighborhood Design Review Board or your lifestyle. Again, you would be looking at re-drawing the plans, negating any savings. Every home site has advantages and disadvantages. Every client has personal preferences and unique lifestyle requirements. Your home is usually your biggest investment and has an enormous impact on your daily comfort, convenience and enjoyment. A home designed for your site; taking into account views, prevailing winds, southern exposure, access, neighbors as well as your personal needs becomes a daily joy to live in. Planning pays off in daily dividends living in a home that has been thoughtfully designed for location and owner. 4-Do I need an Architect? The short answer is ‘that depends’. Some developments or jurisdictions require that you use an architect, others don’t. Many design/build firms have an in-house designer or architect that can be very cost effective. 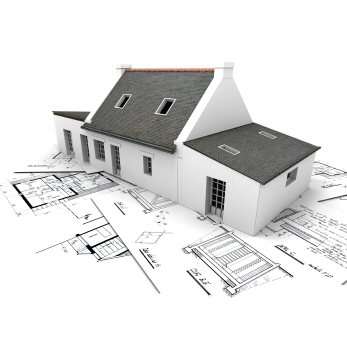 Local draftsmen and even your builder may be very qualified to help with your design. It is important to have a good rapport with your designer and to be upfront and honest about your likes and dislikes. Look at their portfolio and try to walk thru one of their homes if possible. 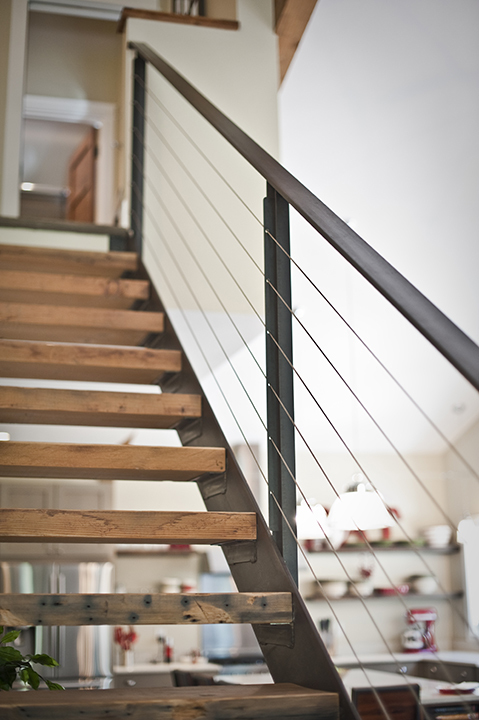 Visit their website and Houzz site to get a feel for their designs. You want to mesh with them on style, size, priorities and budget. 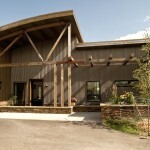 If green building or energy efficiency is important to you, find a designer who has experience in those areas. A thoughtful designer will want to learn as much about you and your family as they can. They will schedule several meeting to review and revise. I send my clients off with homework to help us define their preferences and style. Bringing plan ideas, photos and articles will help your designer to understand what you want. Websites such as Houzz and Pinterest are wonderful for collecting and sharing ideas with your team. How to choose where you want to live! Location, Location, Location is the real estate mantra for purchasing property. While this is a vital consideration when it comes to the neighborhood and its current convenience, value and potential for resale, there are other factors to consider when choosing a lot within a neighborhood. In Northern latitudes like Montana, the most energy efficient orientation for a home is East-West. This means that the short axis of the home runs E-W, with the long sides facing North-South. A long South face maximizes solar gain in the heating season, while the short West face minimizes overheating in the summer months and westerly wind impacts. Every subdivision has through –streets and side streets that create traffic patterns. Drive around the neighborhood and be aware of schools, businesses, parks and athletic fields. Grab a coffee and park on a weekday morning about 8am and observe the traffic patterns. Go back again on weekends. I have friends who live on a cul-de-sac directly behind an elementary school. They are literally trapped in their home between 8-8:30 am and 3-3:30 every school day! The cul-de-sac fills up with parents double parked and blocking driveways to drop off and pick up their school aged children. Open spaces, trails and parks are wonderful amenities in a neighborhood. Typically lots that adjoin open space fetch a premium price and for good reason. Open spaces and parks open up views and provide scenery and greenery around your property. They also serve the community and invite activity and traffic. Often the covenants for homes adjacent to open spaces require different setbacks and fencing. Be honest about your tolerance for walking traffic, which will include dogs and dog poop. 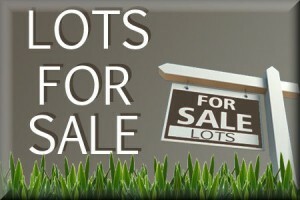 Check the plat map for the lots that interest you and verify setbacks and easements. Setbacks are set by subdivisions and planning entities to assure that homes have a minimum of space between each other, off the street and off of open spaces. Typical setbacks would be 20’ front yard, 5’ side yard and 20’ rear yard. Corner lots are often more restricted. Easements are established when the subdivision is designed. They are laid out to provide access for some future need and are usually either for utilities or for roads. A road easement would tell you that the city anticipates widening the road at some future date which may or may not affect you and the development of your property. A utility easement gives the utility companies access to their lines. Any fencing in a utility easement should be built to come down easily in sections to allow work to be done. “CC&Rs” is an acronym commonly used in the homeowner association industry. It means “Covenants, Conditions & Restrictions. The CC&Rs are basically the rules of your neighborhood. Generally, the goal of the CC&Rs is protect, preserve, and enhance property values in the community. Most of the time, the rules make sense and are easy to accept. For example, it is pretty easy to agree with a covenant that requires you to mow your lawn and keep it weed-free. However, other rules might interfere with your plans or seem downright unreasonable to you. For example, perhaps you want to park your car in the street and store your extra belongings in the garage. However, an HOA might require you to park your car in the garage. Or, perhaps you are counting on the fact that you will be able to fence the yard to contain your dog, but if you read the CC&Rs, you may find out that the community doesn’t allow fences. Likewise, if you’re planning a big project later on down the line like painting your house a new color, you’ll need to check with the CC&Rs to make sure that the paint color you have chosen isn’t prohibited. You can usually obtain a copy at the County Recorder’s Office as these documents are mostly publicly recorded. If you have the opportunity, it might be good to knock on a few neighbors’ doors to introduce yourself and ask if you could ask them a few questions about the neighborhood. Rural neighborhoods or undeveloped locations may not have traffic issues, but they will have commuting, maintenance and utility issues. Some rural neighborhoods will have either community septic or water, but most of the time you will have to budget sufficiently for a water well and a septic system. Both require permits, inspections and testing and are typically regulated by the State and the County. Power and gas to your location is not a given and should be investigated before purchase. Look around for the transformer boxes that indicate power nearby, unless there are power poles. Often, power will be close by, but natural gas will not be available and you will want to consider a propane tank. The local utility company can give you a good estimate to bring the power and or gas out to your location. Propane tanks can be buried in case you’re not a fan of the ‘tank in your garden’ look! Internet and telephone access are not guaranteed! Many rural locations are ’off the grid’ and may require a satellite system for web/media connections. Do your research. There are rural initiatives that are bringing cable and fiber out to rural areas, but don’t assume that your dream lot is connected. Access is another consideration with the rural property. Roads may need to be built and they will certainly need to be maintained. Provisions for road grading, dust control and snow plowing are often done by a neighborhood group or HOA. Be clear on these expenses as well. In Montana, most rural properties fall under County zoning, which means there can be few permits needed in order to build and far less inspections. If you think this is only good news, think again! It also means that the same applies to your neighbors and there may be a LOT of freedom for everyone to build exactly what they want. You could end up having a gorgeously built house, next to a commercial enterprise, or some other types of structure that do not enhance your living experiences OR your property values! Basically, do your homework! A home is still the biggest investment most of us will make, especially building one from scratch. It can be an enormously fun and rewarding experience, especially when you know what you sign up for in advance! 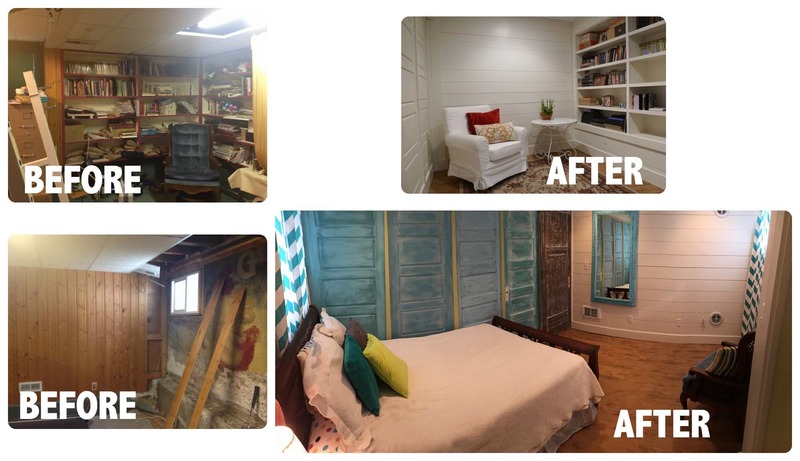 From water damage to basement remodel on a budget! Large built in shelving units that took up too much room. We removed all the old walls and sealed the foundation wall. Next we tackled adding an egress window with a window well for the bedroom area. We used an expanded polystyrene insulation system (Nailstrip) to both insulate and frame the exterior walls. 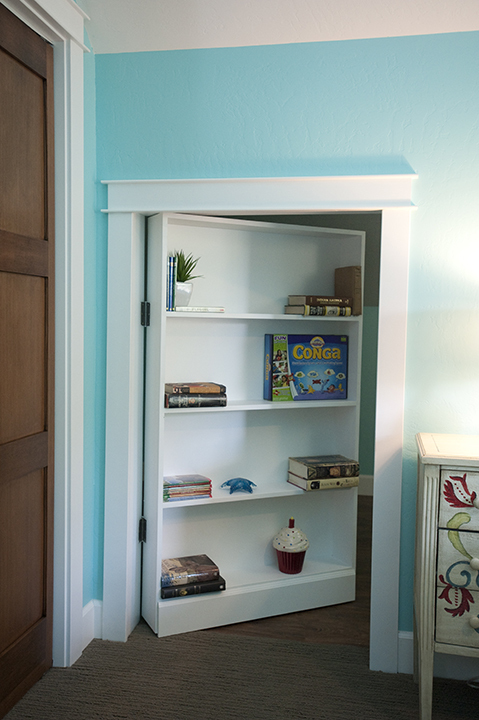 We adjusted wall depth to cover the footings where needed, but used the extra wall space to create built-in bookcases and a closet. 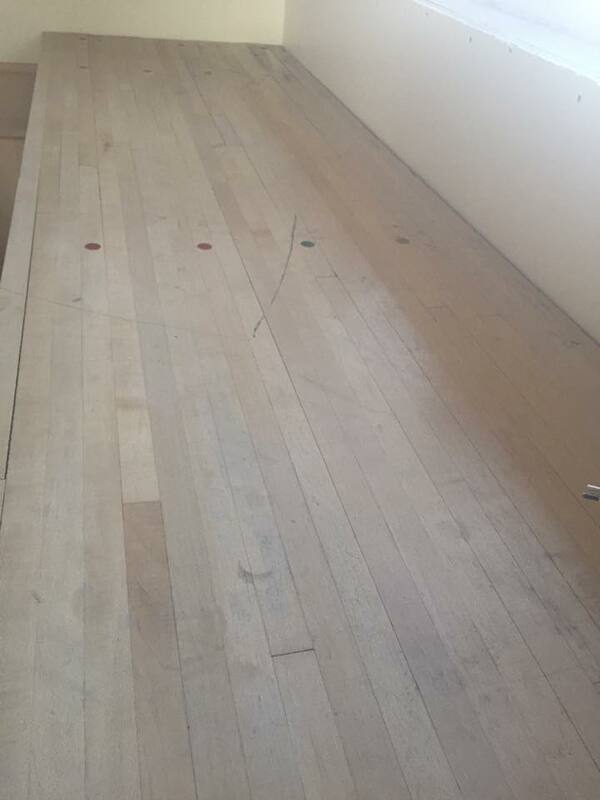 Because it is below grade, we used a solid vinyl flooring for low maintenance. This was installed after we leveled the floors. Instead of drywall we used shiplap wood planks that are painted white to blend with the existing basement walls adding character and texture. To gain as much ceiling height as possible, the ceiling was finished with a joist mounted ceiling pvc panel system and the ductwork was rerouted above the shelving. For current and future functionality, we built an easy to remove ‘wall of doors’ to divide the space. 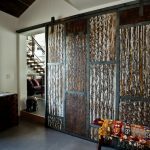 The homeowner purchased several antique doors, and a few new ones to match from a local store’s ‘bone-yard’. The doors were then installed side by side to create a dividing wall. 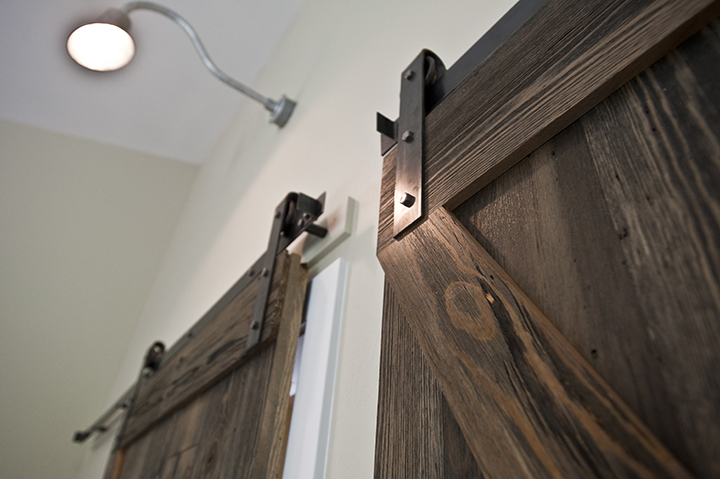 Each door was painted a different color and outfitted with antique hardware for tons of charm! 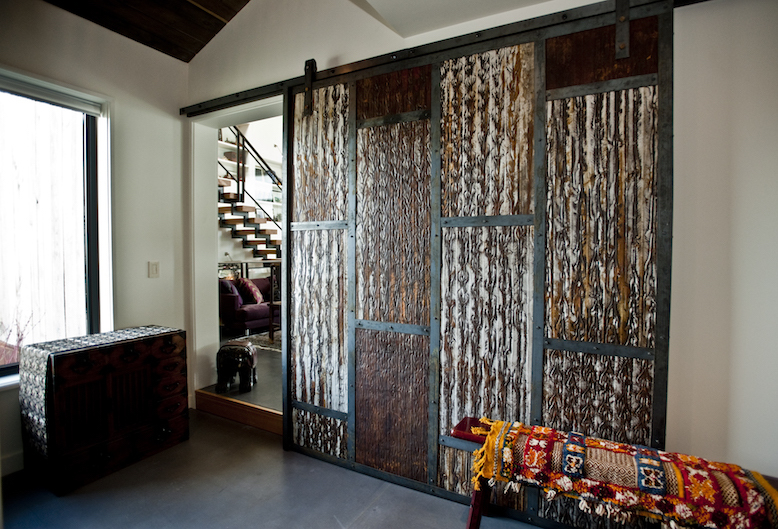 A sliding door with barn-door hardware was added to give the room privacy. 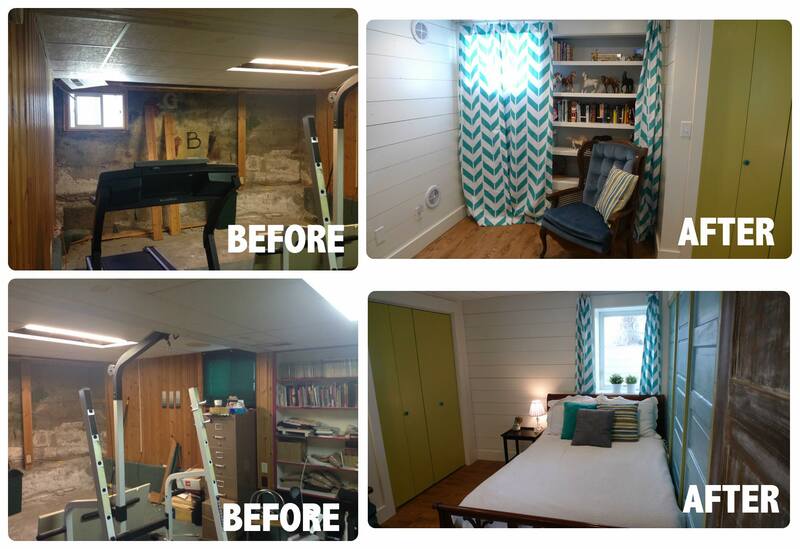 Now the family has a functional, warm, safe and fun space, while repairing damage and keeping to a tight budget! When I was in college, I rented a tiny apartment in a small house that was built in the early days of the 20th century. It had high ceilings and arched doorways with plaster and lath walls and no insulation. I was grateful that the heat was included with the rent. The enormous furnace in the basement would ignite and fill the space with warm air, then it would shut off and I got a first- hand experience in what we call ‘Air Changes per Hour’ (ACH) as the cold exterior air would quickly replace the warm air. I could feel the breeze! ACH is how many times the air in a space or home is replaced per hour. Old, leaky homes might have 12 or 15 air changes per hour. (No wonder it felt windy!) Since the 1970’s, the building industry, with the help of new technologies, techniques and Code requirements, has steadily brought the average ACH down. Right now in my community, we are required to test new homes and achieve an ACH of less than 4 ACH. Many homes are coming in at less than 2 ACH. We have gotten pretty good at sealing up our homes. As we have tightened up our building envelopes, we have also seen an increase in indoor air pollution, mold problems, and allergies. Fewer air changes mean less fresh air, less ventilation and the build-up of pollutants and moisture inside our homes. People, activities and objects in our homes give off moisture, carbon dioxide, formaldehyde, volatile organic compounds (VOCs), chemicals, pesticides, and molds. Formaldehyde and VOCs are released from furniture, carpeting, stains and paints. Pesticides can come into our home on our shoes and from pest control products, plants, and produce. 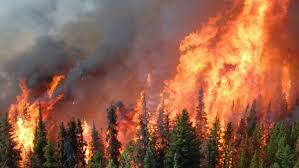 Pollutants are released from the combustion from oil, gas and kerosene appliances. Household products for ‘freshening’ and cleaning fill the air with chemical fragrances and toxins. Moisture is released by the people, plants and animals in our homes and by activities like cooking, showering and laundry. While moisture in and of itself is not ‘bad’ (especially in a dry climate like Bozeman), excess humidity can cause considerable problems like mold, mildew, condensation and dust mites. What can be done to improve the air quality in our homes? 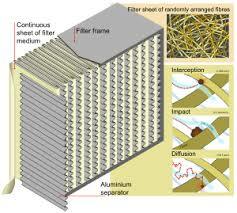 There are two main strategies: reduce the pollutants introduced into the home, and increase ventilation. Reducing pollutants can be achieved by choosing non-toxic household cleaners, furniture and carpeting manufactured without formaldehyde (which is getting easier and easier as more manufacturers are changing the glues and products they use) and low or no VOC paints, adhesives and stains. Air cleaners can be used to reduce some pollutants, mostly allergens like pollen and dust, but beware that some cleaners actually release ozone and a by-product and are not recommended. Changing the air filters on your furnace every season and using a HEPA filter vacuum can be beneficial. Increase ventilation by using your bath fans, vent hoods and windows. Every time someone bathes or showers the bath fan should be run for a minimum of 30 minutes. It is super easy to change your fan switch for a timer switch. Your kitchen vent hood must vent to the outside and should be run whenever you are cooking both for moisture and combustion pollution removal. Humidity levels should not exceed 36-38% for a healthy home. When the weather is appropriate, open your windows to flush out the air in your home. Even in the winter it can be beneficial to turn off the heat and open several windows on a warmer day for ½ an hour. In Southwest Montana we are lucky to get several warm days during the winter season to take advantage of such a house flush. Just don’t forget to turn the heat back on when you close the windows. Ventilation can also be mechanized and automated to improve the air quality and reduce reliance on every day actions. Whole house fans can be programmed to run on a schedule. A garage fan can be put on a motion detector to turn on when vehicles enter or leave to reduce carbon monoxide. Some new homes are being built with Energy Recovery Ventilators (ERVs). ERVs continuously bring in fresh air while capturing much of the heat energy of the outgoing air and transferring that energy to the incoming air which reduces the amount of energy required to warm the incoming fresh air. ERVs can also be added to an existing home to improve the ventilation. The building codes have required fans in bathrooms for years, but the need for whole house ventilation is real and overdue. Any home built to modern standards should have a thoughtful, reliable, programmable way to bring in fresh air on an ongoing basis. Healthy air strategies can become second nature with fans on timers and awareness of potential hazards. Here’s to your family’s health!